Activities in and outside LAU raise awareness on equal citizenship rights. Iqbal Doughan discusses women's citizenship rights at LAU. 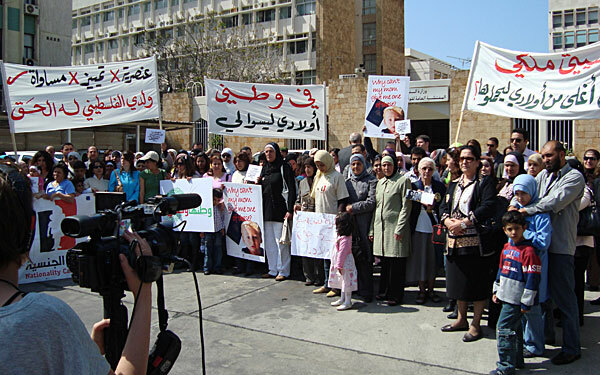 A demonstration about citizenship rights in front of the Ministry of Interior. (Photo by LAU student Dib Ghanawi). The Lebanese nationality law discriminates against women and violates their rights, said prominent lawyer and activist Iqbal Doughan during a lecture on LAU’s Beirut campus April 8. While foreign wives can automatically receive the Lebanese nationality from their husbands, Lebanese women married to foreigners can’t grant it to their spouses or children, explained LAU instructor Brian Prescott-Decie, who organized the event in collaboration with the university’s Institute for Women’s Studies in the Arab World. Around 16,000 Lebanese are suffering from this discrimination, according to Doughan, who’s the president of the Working Women’s League in Lebanon. “This contradicts article 7 of the Lebanese Constitution which states that all Lebanese are equal and equally enjoy civil and political rights,” said Doughan. “Countries that do not grant equal rights to their citizens are flawed,” because the issue creates societal concerns on several levels, she added. “If a Lebanese woman who registered her properties in her name passes away, her direct family cannot inherit” the wealth, said Doughan. This way, families are often denied access to higher education, health care, and land ownership. In other cases, women are forced to become the sole providers in the family because their spouses have limited employment opportunities, Doughan said. Without nationality, children are considered foreigners in their home country and are required to obtain residency permits. This often makes them susceptible to crime or drug use, said Doughan. Recently, the issue has given rise to a social movement marked by demonstrations, sit-ins, and a workshop organized in March by the United Nations Development Program and the National Committee for the Follow Up on Women Issues. Various NGOs and human rights activists have voiced their concerns in the media. A group of LAU students and faculty members showed their solidarity during a national demonstration on April 27, said Prescott-Decie. He’s one of the founders of the Fathers and Sons for Citizenship, an organization dedicated to supporting Lebanese wives to obtain full rights to pass on their citizenship. “If you walk around the campus and ask each class, I think you will find at least one student in every class who has this problem, if not more,” said Prescott-Decie, who has identified seven of his students who don’t hold the Lebanese nationality. In 2006, CRTD–A, a women’s rights group, submitted a draft law to the parliament permitting women to confer their nationality. Algeria, Egypt and Morocco have amended their nationality laws since CRTD–A launched its Nationality Campaign in the MENA region in 2002, Doughan said. But the campaign continues in Bahrain, Lebanon and Syria.